After seeing a number of leaks from a number of sources of the ‘Next Galaxy’ or the probable Samsung Galaxy S III, we now have another round of leaks. 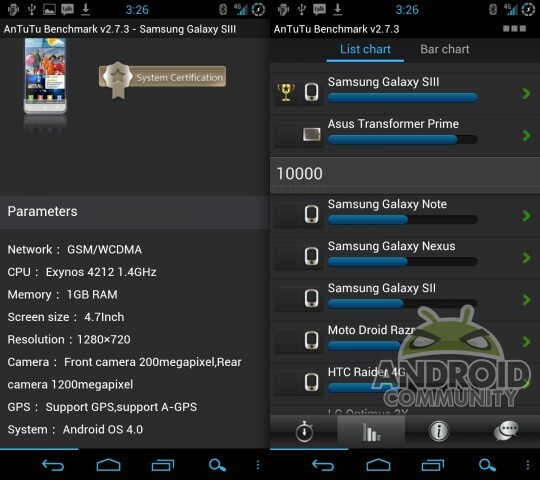 This time we have some leaked benchmark results of the S III. With the help of the AnTuTu Benchmark App, we now have been able to find out a bit more about the Next Galaxy. According to the results, the Galaxy S III may go on to break all benchmark results and be the king of all the devices. The S III goes on to be the leader in terms of benchmarking and also beats the ASUS Transformer Prime. The app has also gone on to reveal some specs of the ‘Next Galaxy’ and if those are true, then the Galaxy S III will arrive with a 4.7 inch screen with a display huge resolution of 1280 x 720p, will run on Android 4.0 (obviously! ), and will be powered by a debutant 1.5 GHz dual-core Samsung Exynos 4212 processor (No quad-core for now). From the results more specs of the S III reveal, a 12 MP camera at the rear (should be awesome) and a 2 MP front-facing camera. It will run on GSM/WCDMA modes and supports GPS and A-GPS. Remember that these are just benchmark results and they may be forged (but probability is less) and we cannot confirm any of the things until Samsung officially announces the device in London on May 3. Goal.com app review: The ultimate app for the football-crazy!